The Cathedral of the Holy Cross and Saint Eulalia is located in Barri Gotic quarter of Barcelona. It was constructed from the 13th to 15th centuries, though the actual facade was completely redone in 19th century. The cathedral is dedicated to Eulalia of Barcelona, a young virgin who suffered martyrdom during Roman times in the city. 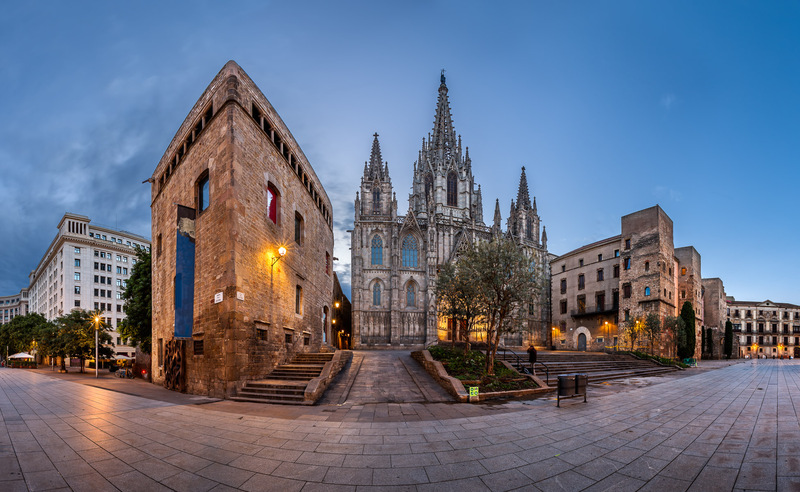 I used panoramic technique to photograph Barcelona Cathedral and I tried couple of different compositions. First of all I shot obvious symmetric composition, but it did’t worked well. After that used left stair as centre of panorama and resulted image became my favourite. Enjoy! Panorama from 4 vertical images, additional exposures for highlights, focal length 16mm, aperture f/11, shutter speed 3.2 seconds, ISO 100, tripod, pano head. This entry was posted in City and tagged Catalonia, Spain.